It was a wonderful journey to the Southern Oregon AVA to check out a remarkable range of varietals grown in this emerging region. It was a smoke filled voyage down to Medford during our dive into Southern Oregon wines. A region that continues to build momentum, Southern Oregon is divided into two sub AVAs, the Rogue Valley AVA and the Umpqua Valley AVA. Within each sub-AVA there is an exceedingly large range of microclimates where vineyards only a few minutes from each other can have remarkable changes in daytime and nighttime temperatures and soil types. There is essentially no typical soil type in the region, which ranges from red clay to blue clay to gravel and sand. Diurnal shifts in this region can be quite extreme. While some vineyards lie only 60-70 miles from the coast, the rainfall in this large AVA varies quite considerably which impacts the vineyards. Klamath Falls has only nine inches of rain each year, while closer to the coast has 109 inches of rain each year. 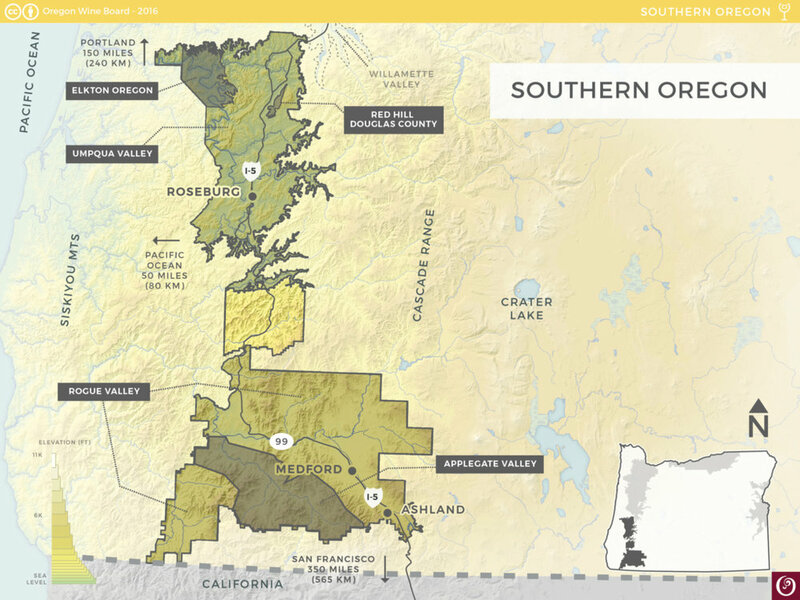 This map is a great resource for breaking down the locations of the exceedingly large Southern Oregon AVA. There are over 30 different varietals grown here which is quite remarkable. The range of wines is quite astonishing as everything from Pinot Noir to Chardonnay to Syrah is planted. I found that the wines showed a great amount of heterogeneity in terms of quality and flavor/aromatic profiles. For instance, the Syrahs typically did not seem particularly similar in terms of aromatic and flavor profiles. Pinot Noir grown in this region tends to be a bit less structured, offering ripe fruits and wines that are sometimes out of balance. The concern is that when these wines are made with less acidity, they become a bit simplistic and reductive. Similarly, I noticed concerns with having fresh acidity in the wines, yet having the wines hollow out in the mid-palate. That was a theme with many of the thicker skinned red grape varietals in this region — while some wines might have been some good acidity, many of the those wines were lacking in mid-palate richness. In terms of producers, standing tall is Abacela, who produces an outstanding Rose, their 2017 Abacela Rose (WWB, 90) which is one of the top wines that I sampled from this region, showing wonderful tension and bright red fruits. Look to the 2014 Abacela ‘Reserve’ Tempranillo (WWB, 91) the best wine I have sampled from this region, which shows wonderful viscosity and tension, with dark fruit and earthy tones. Another standout Tempranillo was the 2015 Reustle ‘Reserve’ Tempranillo (WWB, 90) which has wonderful richness and good acidity which makes it difficult to resist right now. Look to Ryan Rose, a Southern Oregon winery that produces an excellent Cabernet Franc wine, the 2015 Ryan Rose Cabernet Franc (WWB, 90) which shows a wonderful rich mouthfeel and deep dark fruit flavors. One of the more intriguing wines that I tried, the 2012 Dancin Vineyards Port (WWB, 90) is made from Pinot Noir grapes and yields copious dark and red fruits with wonderful mouth-watering acidity. Here is a sampling of the recent red and white wines out of Southern Oregon.